An intense solar flare unleashed the biggest radiation storm in years today (Jan. 23), but astronauts aboard the International Space Station are not in any danger, NASA officials say. 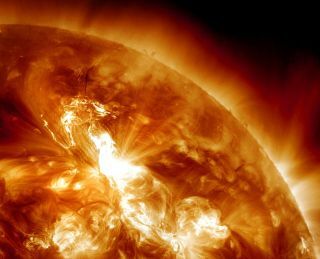 The sun eruption triggered the most powerful radiation storm since 2005 in a wave of charged particles that is expected to hit our planet Tuesday (Jan. 24) at around 9 a.m. EST (1400 GMT), according to experts at the Space Weather Prediction Center, which is operated by the National Oceanic and Atmospheric Administration (NOAA). NASA scientists also routinely monitor space weather conditions in order to protect astronauts and hardware in orbit from harmful radiation, and today's solar storm is no exception, agency officials said. "The flight surgeons have reviewed the space weather forecasts for the flare and determined that there are no expected adverse effects or actions required to protect the on-orbit crew," NASA spokesman Kelly Humphries told SPACE.com. The solar flare erupted this morning at 0359 GMT (which corresponds to late Sunday, Jan. 22 at 10:59 p.m. EST), triggering a solar explosion known as a coronal mass ejection that sent a stream of charged particles into space. When these charged particles hit Earth they stream down the planet's magnetic field lines to create so-called geomagnetic storms that can supercharge Earth's auroras (also known as the northern and southern lights). But space weather can also have negative effects, such as interfering with power grids and communications infrastructure on Earth, and disrupting satellites and other spacecraft in orbit. According to the skywatching site Spaceweather.com, today's coronal mass ejection "will deliver a strong glancing blow to Earth's magnetic field on Jan. 24-25 as it sails mostly north of our planet." In response, NOAA's Space Weather Prediction Center has issued a geomagnetic storm watch, and the agency's deputy, Kathy Sullivan, said that polar flights are expected to be re-routed.